The Cacador MALE UAV performed its maiden flight in June 2016. Image courtesy of Israel Aerospace Industries Ltd. The Cacador UAV can fly at altitudes of 30,000ft. Image courtesy of Israel Aerospace Industries Ltd.
IAI’s Heron MALE unmanned air vehicle is the base for the Cacador UAS. Image courtesy of Israel Aerospace Industries Ltd. 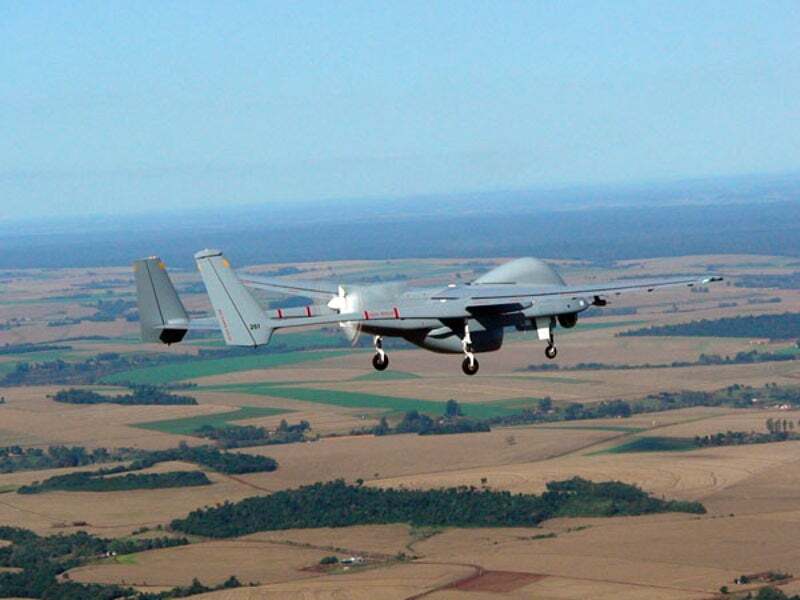 The UAS is produced by Brazilian avionics solutions provider Avionics Services based on Heron (Machatz 1) MALE UAV, which was developed by Israel Aerospace Industries (IAI). IAI supplied technology and know-how for the Cacador air system, as part of a technical co-operation agreement signed by the companies in 2013 to expand their operations in the Brazilian defence market. The Cacador was recently exhibited at the 15th Defence Service Asia (DSA) exhibition held in Kuala Lumpur, Malaysia, in April 2016. As the only class-4 unmanned aerial system deployed in Brazil, the Cacador is intended to meet the country’s tactical and strategic operational requirements. It is suitable for both military and civil missions including intelligence, border surveillance, reconnaissance, search-and-rescue, anti-piracy, illegal fishing, pollution monitoring, anti-piracy, counter-drug operations, illegal immigration, environmental protection, and infrastructure security. It can also be used for environmental and agricultural applications. Components of the Cacador Class-4 MALE UAS include a UAV, ground segment, payloads, and data links. The UAV features high-wing monoplane design with twin-boom configuration. The twin tail booms are extended rearward from the fuselage and are connected by a single tailplane, forming the tail structure. The vertical tail surfaces mounted at the end of the booms are used to reduce aerodynamic drag. The UAV is equipped with a retractable tricycle undercarriage, consisting of two main units positioned under the twin booms and one nose gear located in the forward fuselage. The Cacador has an overall length of 8.5m, a wing span of 16.6m, and maximum take-off weight of 1,250kg. Equipped with an automatic take-off and landing (ATOL) system, the UAS performs automatic take-off and landing manoeuvres. With a maximum payload capacity of 250kg, the UAV is capable of carrying variety of sensors simultaneously to support a wide range of missions. "As the only class-4 unmanned aerial system deployed in Brazil, the Cacador is intended to meet the country’s tactical and strategic operational requirements." A gyro-stabilised gimbal pod mounted under the forward fuselage incorporates electro-optic (EO) / infrared (IR) sensor suite to provide intelligence, surveillance and reconnaissance data under all lighting conditions. The UAV uses reliable line-of-sight or beyond-line-of-sight wideband satellite communications data links for transferring information from the air to the ground segment and vice versa at ranges exceeding 1,000km. The real-time imagery and telemetry data collected by the UAV sensors is processed and stored at the ergonomic rugged ground control station. The command and control solutions at the ground segment allow operators to plan and execute the UAV missions. Propulsion for the Cacador MALE unmanned aerial vehicle is provided by a four-blade pusher propeller driven by a turboprop engine located at the aft of the fuselage. The UAV is capable of flying at altitudes of up to 30,000ft, has a flight time of more than 40 hours, and can travel over a range of 350km. HUBER+SUHNER specialises in systems and components for optical and electrical connectivity for worldwide businesses.